In September I was appointed to the board of the Mount Nittany Conservancy, and this weekend I’ll be in State College to participate in the first meeting of the year. In “The Legends of the Nittany Valley,” folklorist Henry Shoemaker records some of the American Indian and settler stories that provide a cultural and historical foundation for Penn State mythology, including Mount Nittany as our sacred symbol and pristine retreat, the love story of Princess Nittany and Lion’s Paw, and even the reclusive Nittany Lion. Yet stories alone have no independent life to speak of; their significance grows from the affection, tenderness, and patience of the reader, from the moments spent in solitude or near friends with the words of a long-dead peer over a coffee at Saints or W.C. Clarke’s. Herodotus or Dante would be nothing without the gift of time and attention paid in gratitude by the living reader. It’s through that gift that we reverence something culturally significant, and make something from the past a part of our present time. This is what tradition is, if distilled: the continuing act of encountering the past, helping it come alive again in some way, and then in due course becoming a part of the past ourselves as we look to the future. This beautiful notion is encapsulated in an even more beautiful, practical example: The singing of Robert Burns’s 1788 “Auld Lang Syne” every New Year’s Eve. It’s a literal and lyrical Scottish injunction to remember our friendships and honor days gone by on the eve of a new time. This helps explain why Mount Nittany, by all accounts an ordinary Pennsylvania mountain, is nonetheless sacred for Penn Staters and the people of the valley. As with the stories of the past, we’ve infused the Mountain with a distinctive meaning. Penn State Professor Simon Bronner writes that we “inspirit the land” of Mount Nittany and places like it. We do this in a thousand distinct ways, through hikes alone to learning and sharing the same stories to nights spent with friends around a small fire. Mount Nittany is one of those Pennsylvania mountains, and the Nittany Valley remains a place where legends continue to take shape. Thanks to Henry Shoemaker’s stories, and the Mount Nittany Conservancy’s new podcasts, you can get a better sense for why the Mountain matters and why hiking it is such a special experience. Hiking Mount Nittany is one of those things that finds its way onto the Penn State bucket lists of most students, and it’s something many make a ritual pleasure. A single hike often serves as an occasion for encounter with “local color” of the Mountain and the valley, a color which has a radiance that outlasts every autumn. That gesture spawned what might be called the tiny library movement, leading to his founding of a nonprofit organization called Little Free Library a year later. Since then more than 75,000 Little Free Library boxes, which blend the form of folk art with the function of a community water cooler, have popped up in all 50 states and in 88 countries. I’d like to see a Little Free Library at the Mount Nittany trailhead in Lemont at some point. I think it would be a great thing for hikers to be encouraged to spend time on the mountaintop with nothing but the trees and a great book. Peter Atkinson and I slept in after last night’s barbecue, eventually making our way to Mount Nittany by mid-morning for a hike in fairly steady rainshowers from the trailhead to the Mike Lynch Overlook and back. It was one of my favorite hikes. The Mike Lynch Overlook was totally obscured, with the look of a veil of mist and rain having been lowered almost directly in front of us as we peered out onto the imagined view of Penn State’s campus. Along the Mountain’s ridge the rain continued, thick and chilly and spring-like. Afterwards we ate breakfast at Cafe Lemont, then drove back into State College where we showered and cleaned up, made it to Our Lady of Victory for mass, and closed out the trip with a Corner Room lunch before Peter caught his ride back to New York. As I was finishing some errands, I walked out onto Allen Street where Ray Cromie was slowly making his way toward College Avenue. We walked slowly together to his destination as we caught up for the first time in at least a year. I met Ray when I was involved with The LION 90.7fm as a Penn State student, when Ray’s “Avant Garde” show took listeners on journeys to strange and wonderful soundscapes. Still raining as afternoon gave way to evening, I hopped into my rental car and made my way back to Philadelphia. I met a mystic today. A remarkable man emailed me yesterday, asking if I would meet him on Mount Nittany to hear about a vision for a few acres. Today I met him, and spent most of the afternoon in his orbit. I’m not sure how to put the experience into words. He spoke for all but maybe ten percent of the nearly five hours we spent together, and the sheer volume and velocity of his thought was incredible. I won’t soon forget him, this mystic figure who occupies what he calls “real time” and who experiences a distinctive life. First, an answer to the riddle, “Why do they call them ‘Nittany’ Lions?” What if, rather than owing either to any American Indian folklore or to thin-air invention of a never-seen breed of mountain lion, there were a simpler and more likely answer? What if the earliest settlers noticed something different about the Pennsylvania mountain lions that lived and lingered near the Nittany Mountain, some distinctive and maybe peculiar demeanor or set of habits that set those Pennsylvania mountain lions apart, those looks that drank their water from the springs of the Mountain and prowled beneath its ancient canopies? “Those Nittany mountain lions,” the settlers might have started to reflect amongst themselves… “There’s something about them…” An answer to a riddle that presents another. But the simplest answer yet: those Pennsylvania lions acted differently when they were near Nittany Mountain, for whatever reason. Visiting Penn State/State College/Lemont/Boalsburg this weekend for the first time since late January. Tonight I’m heading to “Mount Nittany Night” at Mountain View Country Club in Boalsburg, which will bring together a few dozen of the Mount Nittany Conservancy’s supporters. I think this is the third “Mount Nittany Night” of the eight they’ve hosted that I’ll have been to. It’s good to be in Happy Valley in summer. Peter Atkinson gets in from New York tonight. The second podcast, “The Story of Mount Nittany,” is a meditative 40-minute encounter with the reason the origin stories matter. In it, we hear from the people who conserve the Mountain for all to enjoy, from personalities as varied as Nittany Lion’s letterman Bob Andronici and student-volunteers combating erosion, to trailblazer Tom Smyth recounting decades of history (at 13:30), to Vince Verbeke’s “wayfinding stations” (18:21), to Penn State Arboretum director Kim Steiner’s insight on Mountain forestry (21:25), to Mount Nittany Conservancy founder Ben Novak’s experience of the “ordinary” Mountain (24:04), vision for land acquisition (28:08), and creation of square-inch deeds (31:55), to Bob Frick’s experience with less-preserved mountains (25:30), to Ben Bronstein’s historical markers (26:15), to Sue Paterno’s reflection on the Mountain (32:37) and Coach Joe Paterno’s affection for Mount Nittany as one on the Mount Nittany Conservancy’s inaugural board. Bob Frick, a Mount Nittany Conservancy board member, served as the executive producer of these podcasts, which were co-produced with WPSU’s Katie O’Toole and Patty Satalia. “Hiking Mount Nittany” is one of those things that finds its way onto the Penn State bucket lists of most students, and it’s something many make a ritual pleasure. A single hike often serves as an occasion for encounter with “local color” of the Mountain and the valley, a color which has a radiance that outlasts every autumn. 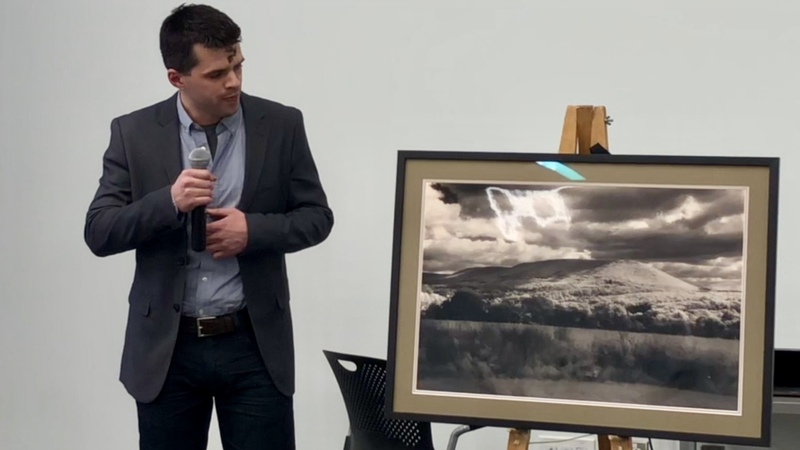 In speaking to Penn State students earlier this month on “Inspiriting Mount Nittany,” I mentioned Henry W. Shoemaker, Pennsylvania’s first folklorist. I thought I’d share a bit more about him, because his life was remarkable not only in Pennsylvania history, but for its lessons about the value of human beings sharing stories with one another and how whole cultures can be stronger and more remarkable as a result. Shoemaker wasn’t just Pennsylvania’s first folklorist. He was also a prolific journalist, and Progressive-Era friend of people like Teddy Roosevelt. He’s most remembered for his many volumes of American Indian folk stories and legends collected throughout Pennsylvania. Shoemaker preserved settler-versions of what were claimed to be some of the last surviving oral stories of the American Indians of Pennsylvania—the Lenni Lenape, the Iroquois, Shawnee, Susquehannock, Tuscarora, Oneida, and others. A few of his more well known collections include Juniata Memories: Legends Collected in Central Pennsylvania, Black Forest Souvenirs, Allegheny Episodes, Susquehanna Legends, and Penn’s Grandest Cavern. Simon J. Bronner, a Penn State professor, wrote a biography of Shoemaker in 1996 called Popularizing Pennsylvania: Henry W. Shoemaker and the Progressive Uses of Folklore and History. It’s at least in part thanks to Henry Shoemaker that the world knows the “Nittany Lions” of Penn State, and that we know of the Indian legend of Princess Nita-Nee. A few years ago I helped the Nittany Valley Society compile a special collection of the folk stories and legends specifically pertaining to the area of Central Pennsylvania where Penn State is located. The book is called The Legends of the Nittany Valley, and is a small way we hope to perpetuate not only the stories themselves, but also memory of Shoemaker and other American folklorists incredible efforts in the late 19th and early 20th centuries to perpetuate a spirit and feeling for the American Indians who we so thoroughly wiped away from their historic homes. Despite pioneering folklore as an interest of Pennsylvania government as a means of “inspiriting the land” and cultivating civic pride and common experiences in an increasingly diverse and pluralistic America, folklorists who’ve come along since tend to look down their noses at Shoemaker and his contemporaries, like Katharine Berry Judson in the Pacific Northwest or William W. Canfield in New York. Shoemaker opens himself to the criticism of contemporary folklorists because he injected too much of his own voice and his own era’s sensibilities into lots of his folklore. This has led to the charge that Shoemaker simply wrote all of the folklore himself. I’m far from convicted that Shoemaker created all of his folklore. Even if true, it would mean that he was incredibly creative and prolific, deserving of honor in and of itself. But more to the point, he frequently cites people he spoke with on trips throughout Pennsylvania and discloses the towns and places he heard stories, and thanks specific people by name. If all of this was purely fictional, in other words, practically everyone would have known it at the time. And the historical record doesn’t seem to bare that out. In any event, the nature of oral stories and tradition is that the details of the folklore tend to change with almost every telling even while the stories attempt to retain the essence of their narrative. That’s what oral tradition is: the histories and stories of people passed down by the person-to-person telling. I wish Shoemaker interjected less of his generation’s own attitudes, biases, etc. into many of the stories. But it’s still easy and worthwhile to read them and enjoy them for what they are: fantastic stories that might just reach back into the earliest human stories and experiences of Pennsylvania shared by American Indian peoples, who we can still try to honor as our cultural ancestors. The photo above shows Henry Shoemaker at Restless Oaks in 1913 with “Ramsden Rex,” his “English-bred Russian wolfhound.” I think the Juniata College Archives has the original version of this photo. As part of the talk, I presented the students with a Square Inch Life Estate Deed to Mount Nittany. Life Estate Deeds are available through the Mount Nittany Conservancy, and are a true, legal square inch deed recorded in the Centre County Office of the Recorder of Deeds. To learn more of the Mountain’s history and significance, be sure to read Conserving Mount Nittany: A Dynamic Environmentalism or listen to the audiobook version for free. It was a fun talk, even though it was incredibly difficult to pack much of the substance and depth of either the folkloric or practical conservation efforts of Mount Nittany into what was roughly a 12 minute presentation. There was so much that I didn’t have time to address, particularly the relationship between Mount Nittany and Hort Woods, and some of the more interesting aspects of the “Magic of Mount Nittany” fundraising campaign of the 1980s and the narrative of the Princess Nittany legends themselves. But that’s what the book is for. Since I served in UPUA, it has developed for the better. I’d guess there were at least 70 people in attendance. (We were sometimes lucky to meet quorum requirements to even conduct meetings in the first year.) I stayed for the entire meeting, and heard about their campus and community initiatives which each seemed to be positive and important for building a better Penn State. I’ve been spending some time recently on scanning and digitizing a few boxes worth of early Mount Nittany Conservancy archives that Ben Novak provided to me. As the Mount Nittany Conservancy’s founder and first president, Ben was instrumental not only in the organization’s major land preservation and fundraising efforts throughout the 1980s and early 1990s that we covered in Conserving Mount Nittany, but also in creating and promoting the distinctive “Square Inch” Life Estate Deeds, which provide a true, legal square inch of Mount Nittany for the life of the donor—recorded with the Centre County Recorder of Deeds—in exchange for a beautiful, framed deed certificate. When I was on Mount Nittany over Arts Fest weekend in July, I pulled out my iPhone to check Google Maps at one point when we had been walking for a while. We had left the Mike Lynch Overlook- Station 3, and were heading toward the site of the Deeded Square Inches between Stations 5 and 6. But there were a lot of us in tow, and some were leery about the distance, and about getting back down the Mountain to eat at Cafe Lemont before breakfast time was over. I also updated the GPS coordinates for “Mount Nittany” on Google Maps, which apparently pulls from Wikipedia. We’ll see if it’s updated; until it is, I suspect many would-be hikers are deterred after driving for miles without figuring out how to get themselves to the trailhead. Mount Nittany Conservancy makes these trail maps and guides available on their site, but I suspect a lot of people go straight to Google Maps or an equivalent. It was a beautiful Arts Fest weekend, probably my favorite in more than a decade of visiting. I don’t make it back to Happy Valley every Arts Fest, but when I do I try to make the most of it. This year that meant a hike up Mount Nittany with family. The view from the Mike Lynch Overlook over downtown State College and Penn State’s campus is simply incredible. I snapped the photo above as we took a breather after the hike up. And I snapped the photo below as we walked along Mount Nittany’s ridge. Finding sand crunch with the soil and debris of the Mountain as you walk along is a strange thing. I never remember the sandy soil of Mount Nittany, and so am always surprised by it. Growing up with the sandy shores of Rehoboth Beach, Delaware and Ocean City, New Jersey conditioned me to expect this sort of terrain at the ocean’s edge. It’s fun to find it in such an unexpected place. Proudly powered by WordPress Theme: Ixion Child 2019.